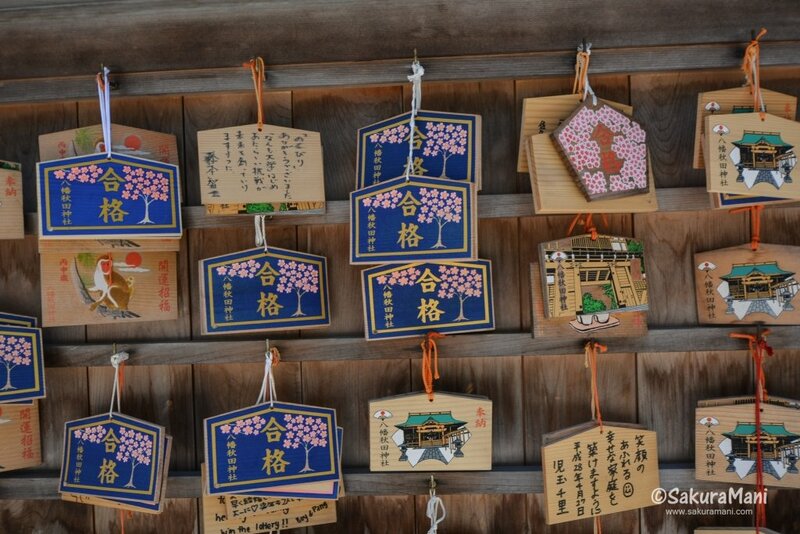 Those cute wooden votive plaques hanging outside a shrine or a temple are called ema. 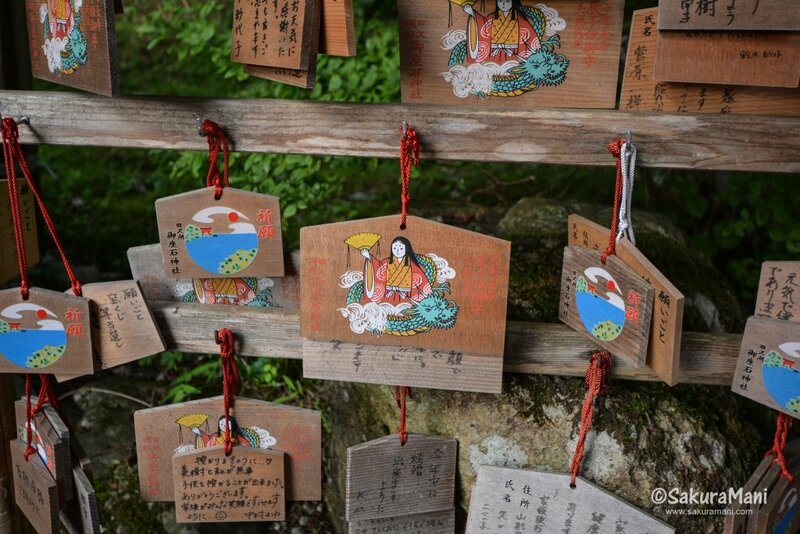 People tie ema for two reasons – when they are praying for something or when their wish comes true. 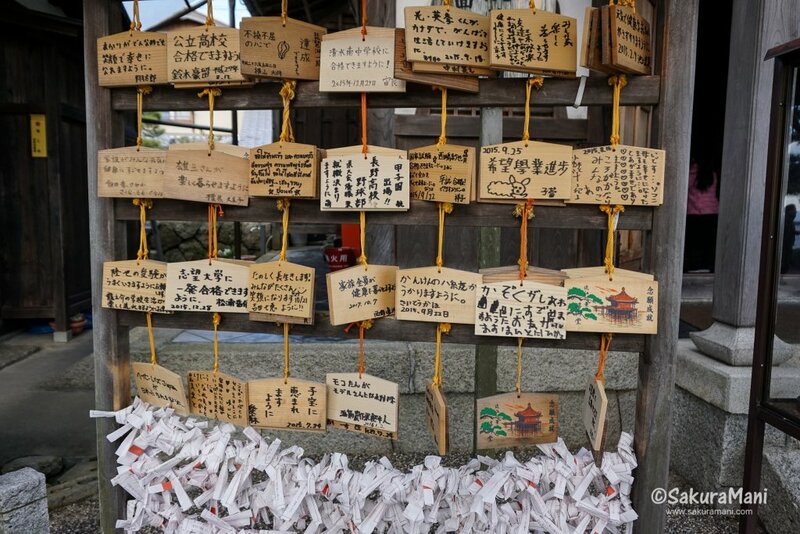 Ema usually come with painted pictures and people just written down wishes on them before tying them up. But why its called an ema? Ema is written as 絵馬 in Japanese, 絵 means picture and 馬 means horse. It was believed that gods came down on horses to the human world. As evident from the old records, live horses were donated by people when they visited shrines to pray for something. However, not everyone could afford to offer a horse. Soon this practice was modified and people started offering picture of a horse painted on a wooden plank instead of a live horse. This came to be know as ema ( 絵馬). Over the years, the appearance of ema changed. The picture of a horse was replaced by pictures of zodiac animals 干支 or something symbolic to the local area. In some shrines you can also draw as you like on the ema. In Shintoism, horses are considered to be intermediaries between this world and the world of Gods. As explained to me by a Japanese professor, some shrines feature horse statues because they are considered as bringer of good harvest. Some statues are contained in a stable and some are kept in the open. It is also believed that white horses brings rain and black horses stop rain. Thus, horses are included in many Shinto festivals and events and some shrines might still keep a live horse in its stable. 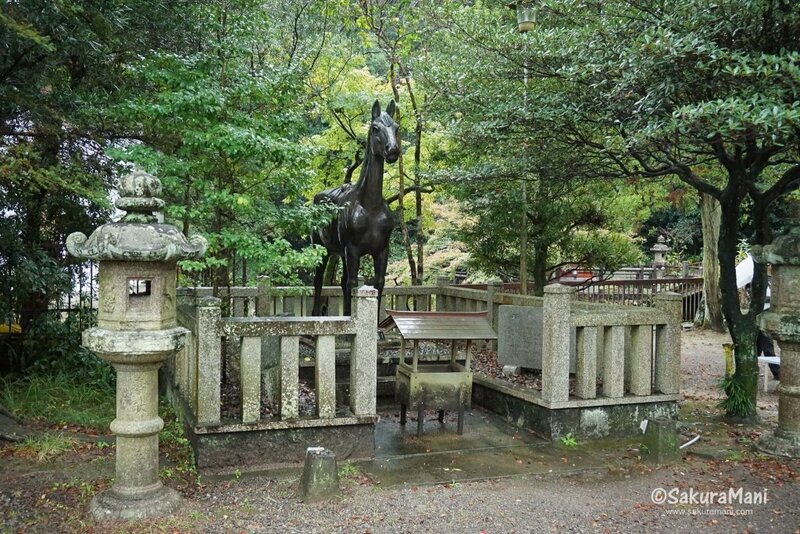 A black horse statue at Tokeii Shrine (闘鶏神社) in Wakayama. 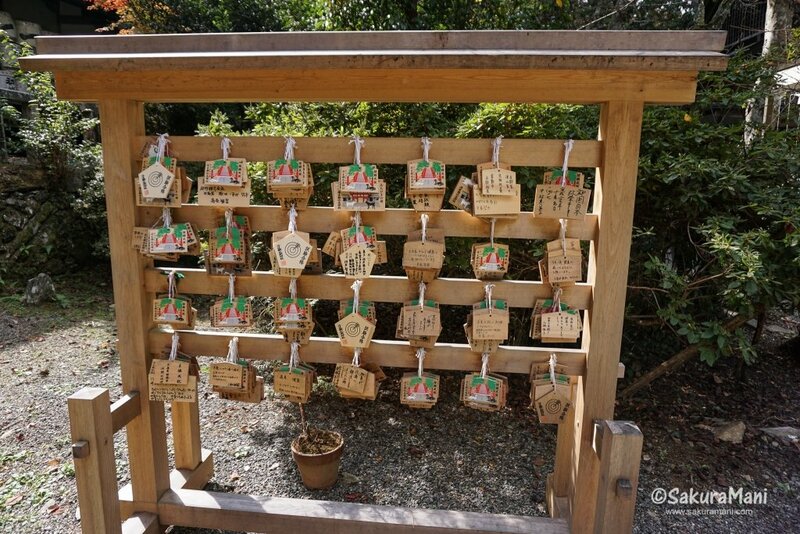 I wonder how many ema are hanging here, at the Kasuga Taisha Prayer Reception Office. 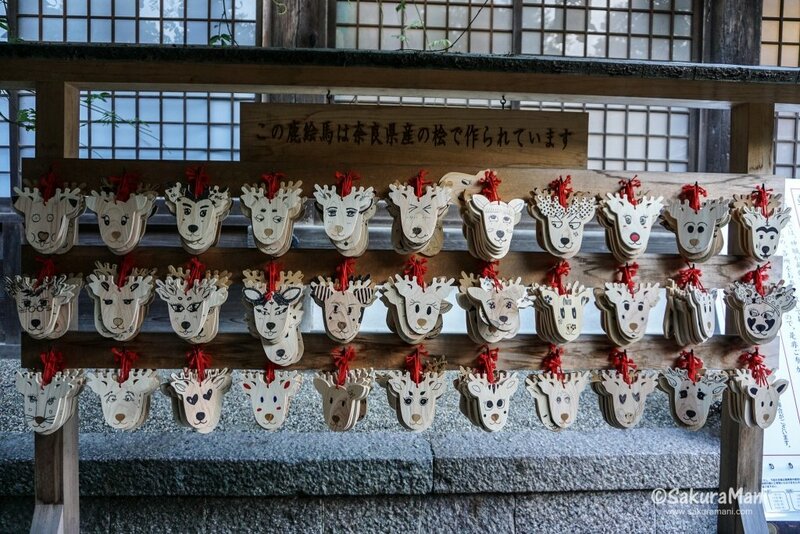 You can draw as you like on these super cute deer shaped ema at Kasuga Taisha (春日大社) in Nara. It is believed that Kasuga deity came down to Nara on a white deer. This myth led to the belief that Nara deer are sacred and they shall always be protected. 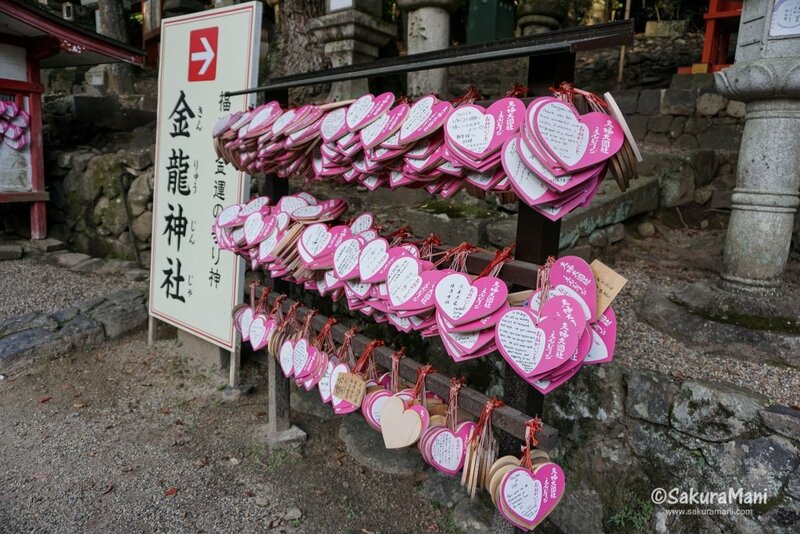 Heart-shaped ema at Kinryuu shrine (金龍神社) near Kasuga Taisha in Nara. Married couples visit this shrine to pray for the longevity of their relationship to the married deities enshrined here. Torii shaped ema at Fushimi Inari Taishi (伏見稲荷大社) in Kyoto. 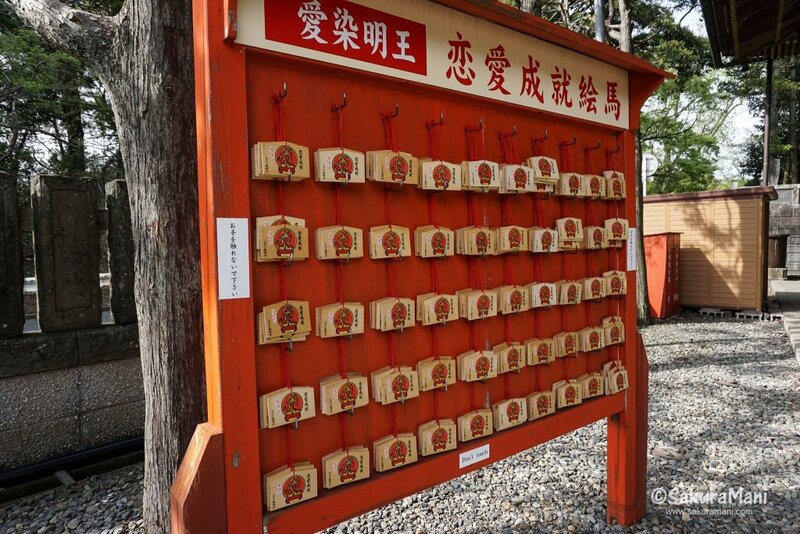 This shrine is the head shrine of Inari (fox) deity. 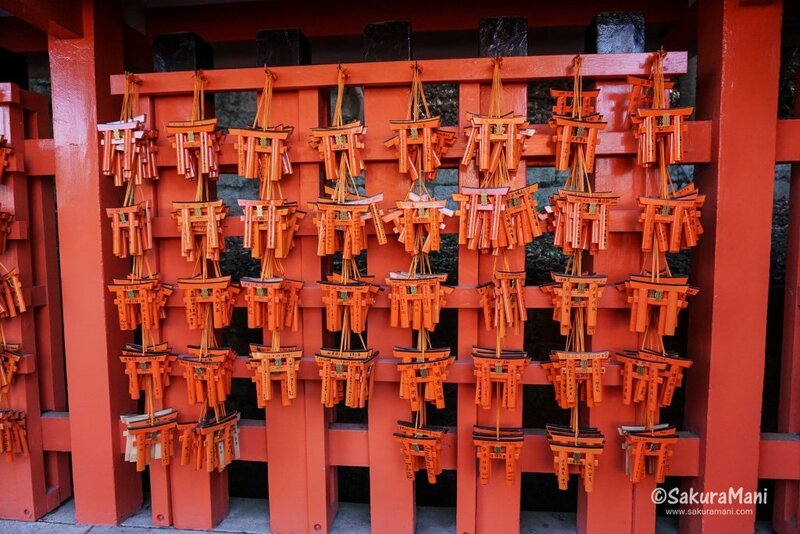 Fushimi Inari Taishi is mostly popular for its ten thousand torii gates. Ema at Mangetsuji temple (満月寺) in Shiga. This temple is popular for its beautiful umikido (浮御堂) or floating platform that stretches out into Lake Biwa. Ema at Nyoirinji (如意輪寺) in Yoshino. The enshrined deity here is Nankiri-Fudoson 難切不動尊 or Acala (in Sanskri). Yoshino is also one on the most popular place to view cherry blossoms (sakura) in Japan. 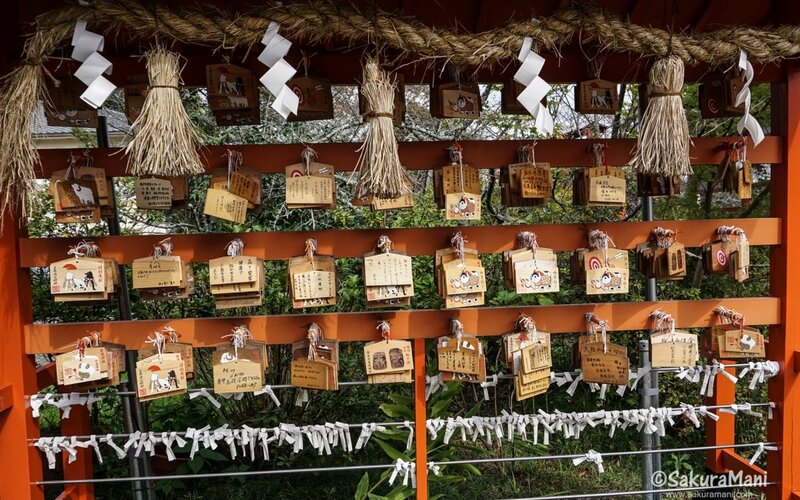 Ema at Niutsuhime shrine (丹生都比売神社) in Wakayama. I visited this shrine on my way to Kii peninsula. 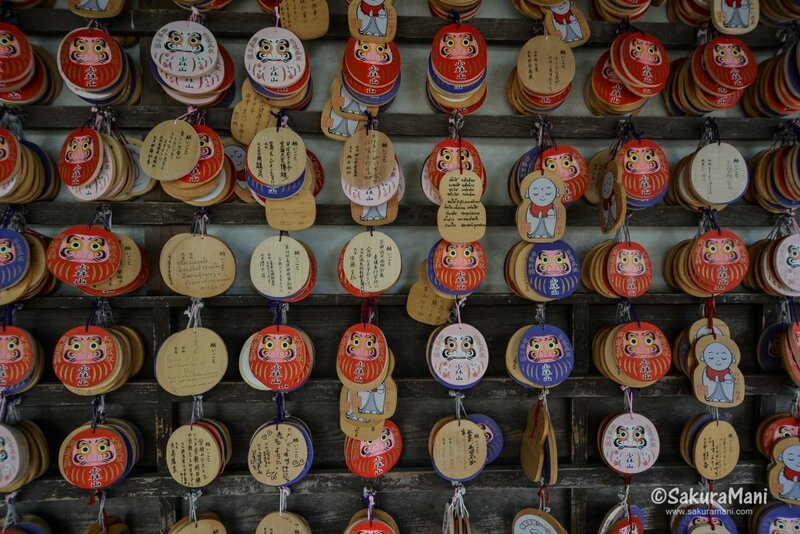 Daruma shaped ema at Shorinzan Daruma-ji (少林山達磨寺) in Gunma. This temple is located in Takasaki city which is the leading producer of daruma charms in Japan. 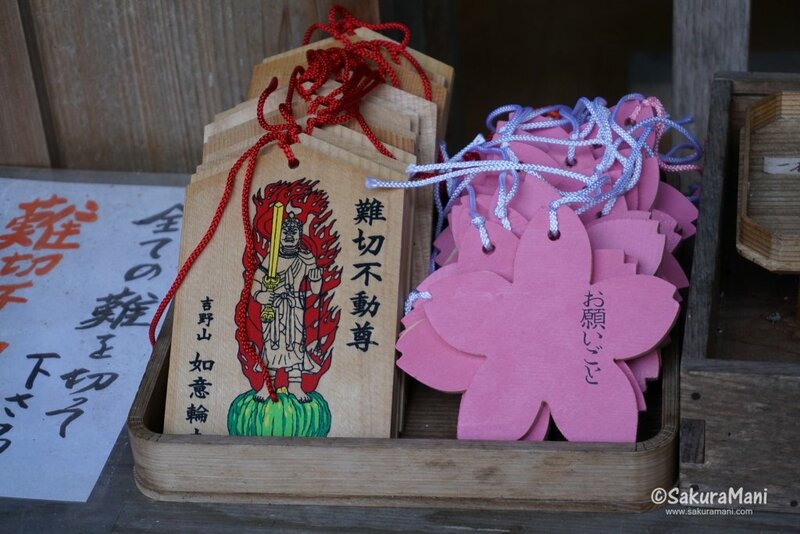 Renai jouji (恋愛成就) or love fulfilment ema at Narita-san Shinsoji temple (成田山新勝寺) in Chiba. The red skinned deity painted on the ema is called Aizenmyou (愛染明王) or Ragaraja (in Sanskrit), he is associated with love and compassion. Ema at Gozanoishi shrine (御座石神社) in Akita. This lovely little shrine is built on the edge of lake Tazawa in Akita. The local legend of Tatsuko who turned into a dragon is symbolic to this area. 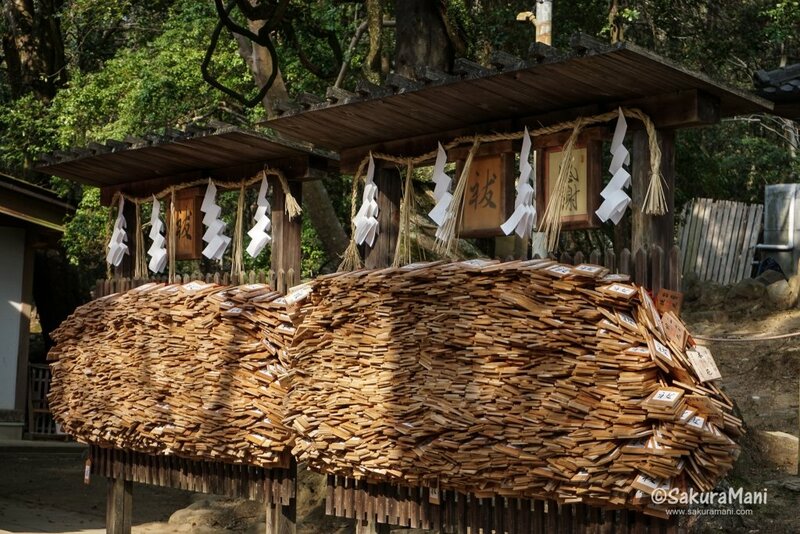 Lady Tatsuko is enshrined here and its an ideal place to pray for beauty and good looks. Ema at Yawata shrine (八幡神社) in Akita. This shrine located inside the Senshu Park in Akita city. The blue ones which have 合格 written on them (which means pass) must have been tied by students who will soon appear for exams.